Southfield, Michigan, March 29, 2018 – The new Puck is simple in form and function. Available in June 2018, the Puck is a smart control that works in conjunction with the GV60/Symax System. Its basic functions turn the fire on and off and adjust the flame height. But there’s an added feature for those who wish for a little fun and adventure. 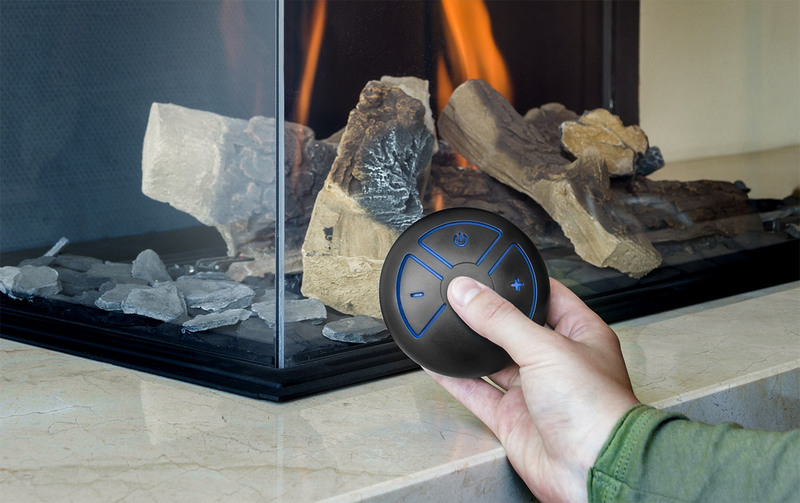 The Puck is equipped with temper­ature sensing that allows the use of the popular myfire app. As shown on myfireapp.com, myfire app’s inter­active, colorful graphics make operating a smart phone or tablet easy and fun while giving absolute control of your gas fire. Its functions include Manual Mode, Thermostatic Mode, Program Mode, Eco Mode, Fan, Light, Personal Profiles Settings, and a Child Safety Lock. The Puck has blue backlit buttons and is available in either black or white.